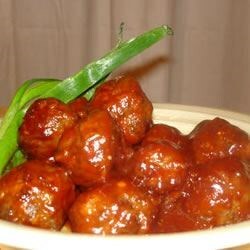 "Cocktail Meatballs in a tangy sauce - easy and DELICIOUS! Serve with your favorite crackers." Remove the crusts from the white bread and tear into small bread crumbs. In a medium size mixing bowl, combine beef, soup mix, white bread crumbs and half-and-half cream. Roll mixture into 1 inch balls and arrange in 9x13 inch baking dishes (as many baking dishes as it takes or bake the meatballs in shifts). Bake 10 to 15 minutes; or until browned. In a slow cooker with the temperature set to high, mix together ketchup, brown sugar and Worcestershire sauce. Cook until the mixture comes to a boil, then reduce temperature to low until you are ready to serve the meatballs. Place the meatballs in the sauce and serve. Very good! I made them for a party and got rave reviews. To make it easier I bought the meatballs already made. Sauce was great! Yummy!....says the whole family and surprise guests that showed up for dinner. Will make again and again, and even for a party this Saturday! I made this for a party, everyone loved them. I combined the meatballs with cocktail wieners. Big Hit!